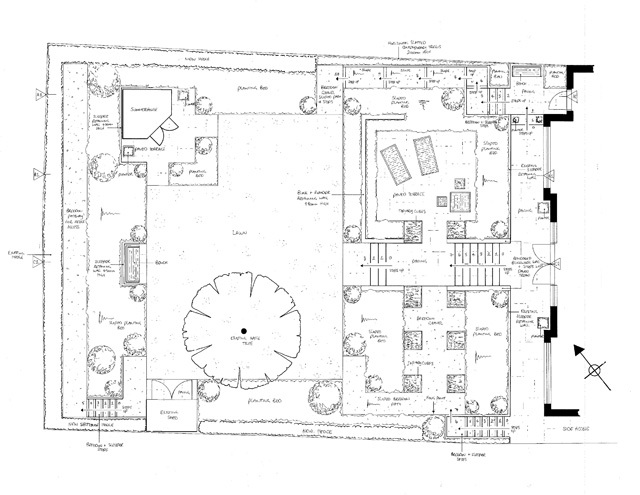 Last weekend I presented the final designs to a client in South Nutfield, near Redhill. 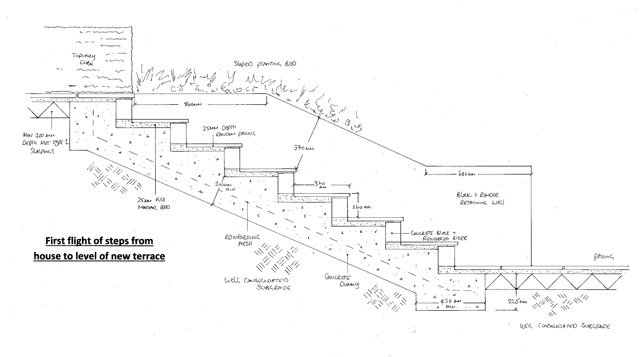 It’s a complicated site with steep levels which always makes for some head scratching but at the same time, gives such scope for a more interesting garden. 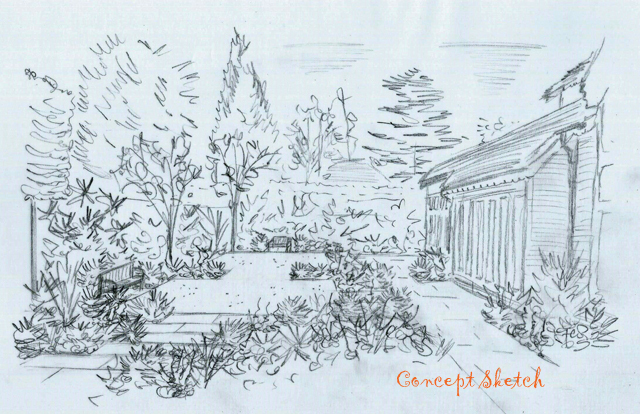 I thought I’d start with a couple of concept sketches and pictures of the garden now. 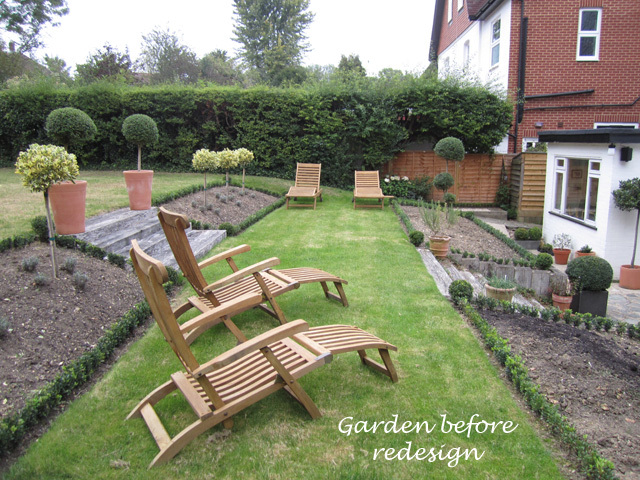 The garden is already terraced, but when the new house extension is built, there will no longer be anywhere to sit as the existing terrace will be covered over. 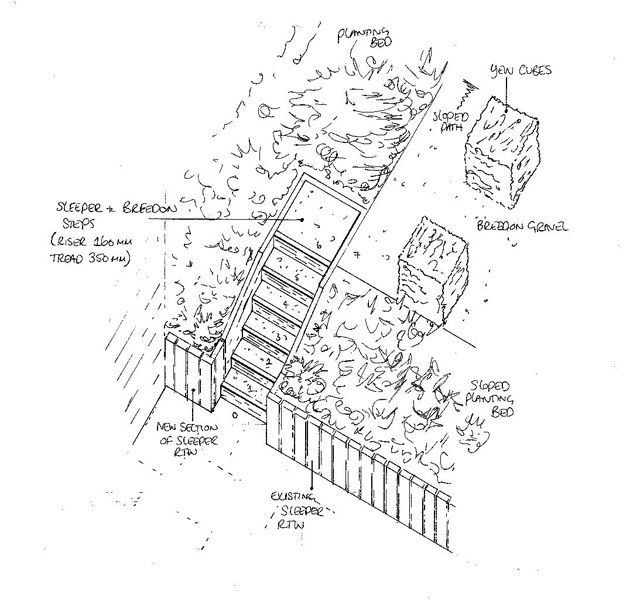 The sleeper steps are also really dangerous – the dimensions of the steps aren’t right i.e. the tread isn’t big enough, and they get really slippery in the winter. 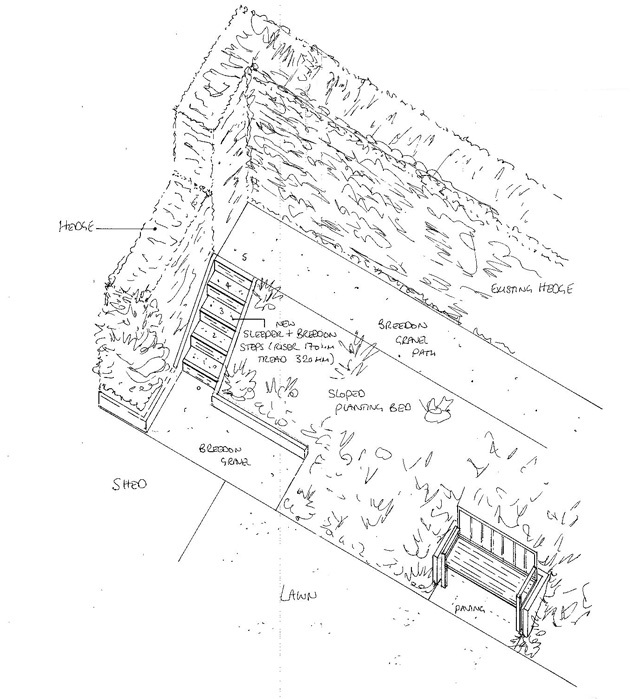 Working with levels can be expensive as terracing a garden requires retaining structures if you want to move soil around. 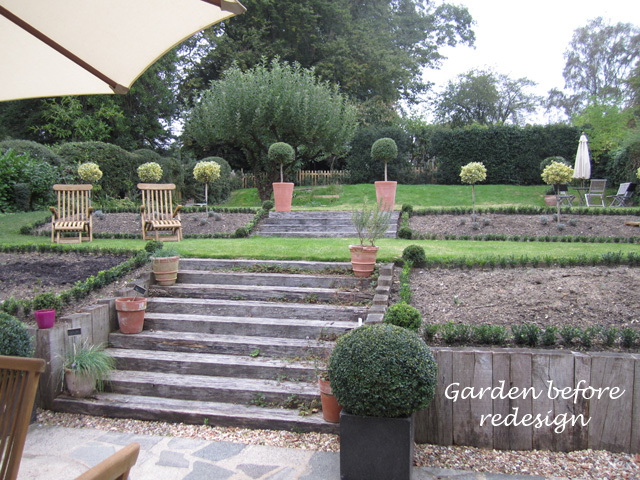 I’ve tried to work with the existing terraces as much as possible to keep the cost down, but at the same time give the garden more character and interest. The main terrace is now on the first level which will involve a bit of earth moving, but will still work with the existing terraces. It’s so important when you’re working with levels that you think about what’s happening to the soil that you need to take away. Ideally you want to keep as much of it on site as possible otherwise you just spend good money on removing waste from site. 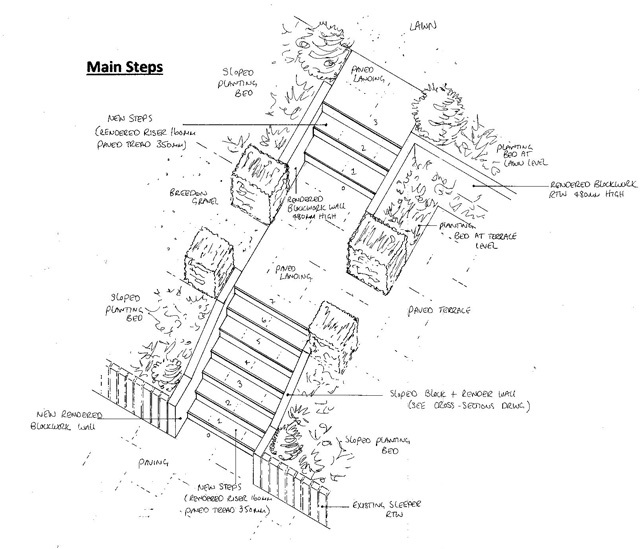 Cross section drawings are essential if you are to get your head around what’s there now and how it relates to the new garden you are trying to create. 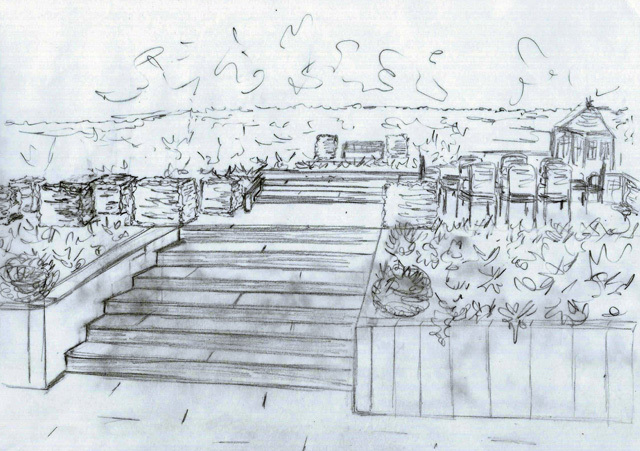 Construction details are also essential to ensure that the drawings communicate properly to the landscaper. It’s really important, for example, that the exact dimensions and angle of the sloped wall for the bottom steps was thought through and calculated properly otherwise it may never look right. The second flight of steps was also important to get right as the wall becomes free-standing at the bottom of the steps. 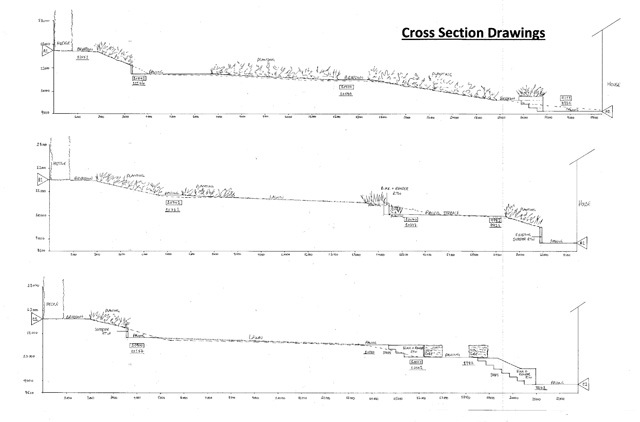 For this project I also put together some isometric drawings of the main elements. 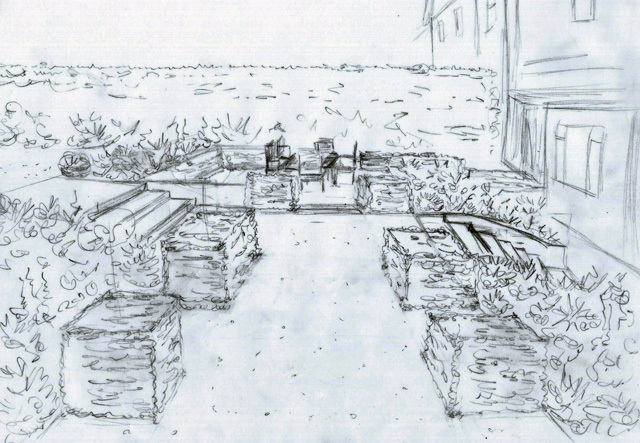 This really helps the landscaper to understand the design vision but also tests my ideas and ensures that I’ve thought through the details properly. There’ll be some delay now before this garden is built because my clients are having some building work done on the house first. 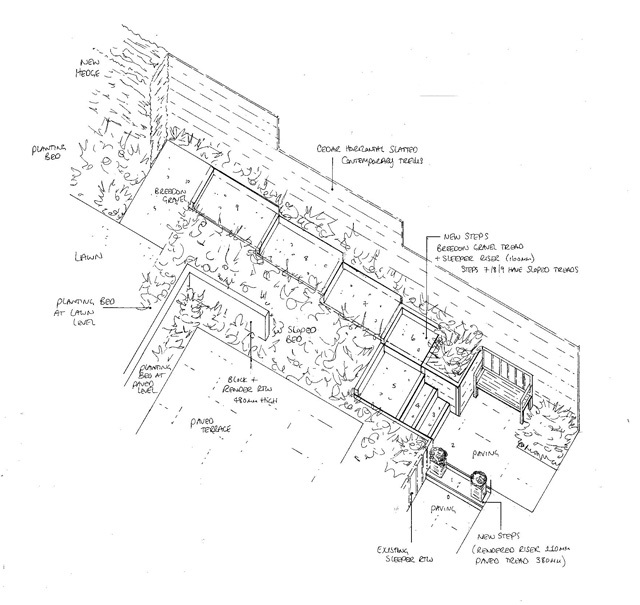 They wanted to plan the garden at the same time so that they had a sense of what was happening and could manage the build with the garden in mind. I think it will make a huge difference to how they feel about the garden and, just as importantly, how they use the space. I can’t wait to see it all finished in a couple of years’ time.